Here is brutal truth about selling ideas before building them. One day you wake up and you have a light bulb glowing above your head. It’s THE moment gets you excited because you know this idea will change the world for a better place. You know this feeling right? But you may also know the feeling of letting your ideas go because you don’t have enough money, time, or perhaps the right people. You may have a wonderful idea that could change the world. You just need a little confirmation, or validation. Receiving validation from your best friends is easy compared to actual customers. 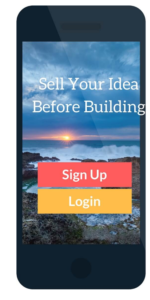 Today, I will discuss how to sell ideas before even building them. But before jumping into that, I need to explain two business terms so you will better understand the other material that I’ll discuss later in this article. According to Eric Ries, the minimal viable product (MVP) is the version of a new product which allows a team to collect the maximum amount of validated learning about customers with the least amount of effort. It’s basically building a minimal feature of your product to gather enough opinions from customers to see if they would buy it or not. Well, Joel Gascoigne, the founder of Buffer mentioned “As minimal as it can be”. The definition of a lean startup is the process for effectively creating a new business by reducing waste (time and money) and focusing on validation. So it comes with MVP. Now that you know what a MVP and lean startup is, I’m going to elaborate on why it is better to sell your ideas before you even build them. Once you receive validation, then you have a green light for production. At this point, you have already reduced the risk of producing for nothing. Also, if you receive bad feedback then it is a good sign. At least you know that your idea needs some more pivoting before continuing with the building phase. You don’t have any risk, costs, and you also save enormous amounts of time. It’s possibly one of the fastest ways to actually start building an idea. This is because you already know that you have potential customers for your idea. Step-by-Step Guide to Sell your Ideas through Design. Now I’d like to talk about a practical step-by-step guide on how to sell your ideas before building them. I am not a programmer. I only know basic HTML, however, I can design. Even if you don’t know anything about design, all you need is just a couple nights to learn basic design; if you really want to make your idea come true. The whole purpose of this step is to design a simple web page such as Buffer. This approach is called a design-based approach and you should pay close attention if you are not a tech-savvy person. 1. Your ideas should be digestible – super easy to understand at a glance. You don’t need a fancy business plan at this point. If you can come up with something as simple and straightforward as possible then it will help significantly. Just in case, you should know exactly what to say to investors, or even just to your friends to see their reaction. This step helps you transform your intangible ideas into tangible ones. 3.Design the Interface on any Designing Platform. You should have somewhat of an image of what the interface should look like; such as the color, logo, and profile (any kinds of features you may want to include in your app). I made this with Canva under five minutes. So if you work on it properly, you can produce a great interface. 4. Sell it, Get Feedback, and Perhaps a Little Pivoting. Now you know what you need to say to investors. You have your awesome design to backup your idea. It’s time to sell! It’s possible that it won’t work at first. You may need to pivot your idea considerably. Perhaps rethink the concept. Don’t give up just yet, not until you have good feedback. Finally you have caught someone’s attention! You know what to do now – build a simple website. A one-page landing page is good enough for a kickstart. Often times, people first build their idea, start selling, and eventually lose money and time. This may save you from going through bankruptcy. The only way to differentiate from them is to actually make it happen. Just designing won’t kill you right?